Preamble: I originally wrote this piece 10 years ago and have done rewrites to it over the years as the knowledge base and my own opinions have changed about things. I’d note that, the changes I’ve made over the years are fairly minor and I’m actually pleased with how well this has held up since I originally wrote it. I find that lifters, especially new lifters often get so fixated on magic, complicated approaches to training and diet (including mine) that they forget to get the basics in place. The simple fact is that the basics and fundamentals are where every diet and every training program should start. Why? Because they always work. More advanced approaches should be brought in when they are needed, not just because the trainee is bored or wants to do them. The bottom line is this: Before you worry about advanced approaches, get your fundamentals straight. That’s what The Baseline Diet is all about. I’m going to start this article with a few questions. How much mass have you gained in the last few months (or years as the case may be)? If you’re like the average lifter, the answer is assuredly ‘Not as much as I’d like’. Ok, next question: how much money have you spent on exotic supplements hoping they’d be the secret to freaky mass? Again, if you’re the average lifter the answer is probably ‘Way more than I should have’. This brings me in a roundabout way to the topic of this article (and it’s continuation which I’ll put up on Monday): while people are always interested in cutting edge new esoteric approaches to mass gain and nutritional strategies, the simple fact is that there isn’t much new under the sun when it comes to bodybuilding or athletic nutrition. There are only three major nutrients (protein, carbohydrates and fat) and you can only arrange them in so many ways. We may know a lot more about optimal nutrition than we did thirty years ago but human biology is still the same as it ever was. The same basic rules still apply and in this article and the next I want to talk about those basic rules. I’ve written a lot of columns and Q&A’s for various magazines (print and online) over the years and, by far, the biggest question revolves around supplements. A majority deals with basic stuff of course: protein powders, thermogenics, creatine but a number also deal with the more esoteric stuff on the market. Bodybuilding magazines are in the business of convincing lifters that taking a lot of expensive supplements it mandatory to reach their goals; because that’s how they make money. Telling a lifter to follow a basic progressive training program with a good nutrition doesn’t make money, getting them to buy a product for $45 per month month-in/month-out does. The simple fact is this, your diet (and of course your training) will determine 90-95% of your success in bodybuilding (or any sport). At most, supplements can add 5-10% to that level. Unless you’re planning on competing, and that 5-10% may mean the difference between winning and losing, spending a small-fortune on supplements is a waste. As well, until you get the 90-95% of your training and diet in order, the other 5-10% won’t make a damn bit of difference. Now, don’t get me wrong, I’m not anti-supplements even if I get painted as such. Sure, I think 99% of what’s out there is crap (and history supports me in that). More importantly, I see too many lifters and athletes focusing on the wrong thing: they want the magic pill that will make them great, but they forget to worry about the stuff that actually matters. Put differently, echoing my mentor: I’m anti-anything that detracts trainees from the stuff that really matters. And supplements all too often do exactly that. Lifters try to make up for failings in the important stuff with a magic pill, and the magazines and companies know and pander to this. Ok, enough of that, let’s get to the article. What is the Baseline Diet? Most simply defined, the baseline diet is what every athlete needs to determine and put in place before they go mucking about with any supplements, or any goofy diet interpretations (including mine). That is, you should establish AND follow the baseline diet for at least a few months, to track your body’s response, before you try anything else. Because until you determine what your baseline response is (and have the fundamentals of your diet in place), you can’t make any sort of objective conclusion about the complicated stuff in terms of results. Now, much of what I’m going to discuss has been said many times before, as I said above there’s not much new here. But I still see enough lifters making the same basic mistakes in their overall daily nutrition that it’s worth repeating the basics again (and again and again). I’m going to divide the baseline diet into six distinct categories which are meal frequency, caloric intake, water intake, and protein, carbohydrate and fat intake. I’ll discuss the first three in this article and the second three in Part 2. Meal frequency may be one of the more hotly debated areas of nutrition these days. While it’s always been dogma (and in earlier versions of this article, I basically reiterated that dogma) that you must eat 6 times per day or more for optimal gains (or weight/fat loss), more recent research has called that severely into question. Recent work into caloric restriction and intermittent fasting suggests that lower meal frequencies may have additional benefits. Some people are even fasting for many hours per day prior to food consumption with many claimed benefits (such as improved insulin sensitivity, calorie partitioning and fat loss). I can’t do intermittent fasting justice in this article, again I’d refer people to Martin Berkhan’s Leangains.com for more information. As I’ve discussed at some point in most of my books, there are more factors which go into choosing meal frequency than any absolute statement (e.g. you MUST eat 6 small meals per day) can cover. How many calories per day someone is consuming, along with several other variables all interact here. A small female consuming 1200-1500 calories per day may prefer to eat fewer smaller meals (so that each is larger and more satisfying) whereas a large male bodybuilder seeking mass gains (who may be consuming 3000-4000 calories/day or more) may need to eat 6 times per day to get in the required food. As I discuss in detail in The Protein Book, any given meal will maintain the body in an anabolic state for somewhere between 4-6 hours depending on its composition and form (a solid meal takes 5-6 hours to digest for example) and the idea that you have to eat every 3 hours or your muscles will fall off, or you’ll go into starvation mode, is simply nonsense. I discuss this in some more detail in the article Meal Frequency and Energy Balance. Now, as many like to point out, higher meal frequencies have been found to improve various aspects of health (notably glucose tolerance and blood cholesterol) but many of these studies use a very unrealistic feeding pattern (e.g. 17 meal/day compared to 3). Whether 6 meals per day has a true benefit over 3 meals per day in terms of health is massively debatable. As noted, emerging research is finding that intermittent fasting and lower meal frequencies may have major benefits. But since this article is about a baseline diet for bodybuilders and athletes, who usually have a fairly high daily caloric intake, a higher meal frequency is probably still going to be preferred. This is just a practical consideration, an athlete with a large caloric requirement will probably find it easier to get them in eating more frequently. Just realize that it isn’t absolutely mandatory. As long as you’re eating every 3-5 hours (assuming large-ish solid meals), you’ll remain in an an anabolic state. Obsessing that it’s been 2.5 hours since your last feeding is simply silly; stressing out over nothing will do you far more damage than going 4 hours between meals. For more details, you can read the full discussion of meal frequency in The Protein Book. Beyond the global issue of meal frequency, an area of major interest and debate is that of nutrient timing. The original version of this article repeated the basic idea that breakfast was a key aspect of halting overnight catabolism, but the research and practical experience of the intermittent fasting folks calls that into question. So I won’t repeat that particular bit of readily accepted dogma. However, nutrient timing around training is currently a massive area of interest with some researchers going so far as to say that timing of nutrients (especially protein) around training is more important to overall results than total protein intake itself. Maybe. There are a lot of issues surrounding the studies (not the least of which is that most of them are done in the fasted state which means they have limited relevance to athletes who have eaten during the day) to date but the simple fact is that the research is fairly clear: nutrients consumed around training are critical to stimulating optimal gains in muscle mass. Now, how soon after training is debatable, one study found that whether nutrients were taken an hour or three hours after training, the results were the same (in older folks, it’s critical that they be consumed soon after training). So the whole focus on ‘You MUST eat within 47 seconds of finishing your last set or your workout was waste.’ is basically a lot of internet nonsense. But the general point still stands, lifters should be eating something around training. Whether it’s before, during, after or a combination of the three, nutrients (and that means carbohdyrates and protein) around training promote better gains in muscle mass. I can’t possibly give sufficient details on amounts in this article. Again, The Protein Book has a 35 page chapter dedicated to the topic of around workout nutrition for those who want to know all the details. In the original version of this article, I made some comments about the practice of consuming nutrients right before bedtime and/or in the middle of the night. The idea was that the time between the last meal of the day and breakfast was one of catabolism and the theory is that eating at this time might help with growth. Maybe. There is data that the gut needs ‘rest’ for optimal function (e.g. that around the clock feeding causes problems) but it’s all based on studies of folks in hospitals so it’s relevance to athletes is debatable. Another consideration is that sleep should not be compromised to get more nutrients into the body. Sleep is critical for recovery and forcing yourself to wake up to eat something probably does more harm than good. I originally said simply this: If you wake up in the middle of the night (e.g. to pee), eating something might be worth considering. If not, don’t worry about it. Basically, I’m torn on this one. Of course, as I mentioned above, the reality is that a solid meal takes at least 5-6 hours to fully digest. If you eat a particularly large dinner meal, that will actually be providing nutrients through a good portion of the night anyhow. I’m just not sure it’s worth worrying about, moreso if it means interrupting good sleep. Although macronutrient composition affects success in bodybuilding and athletics, caloric intake is arguably as important. Invariably the lifters I’ve met who wanted to gain mass (but couldn’t) were either overtraining (or training stupidly) or simply not eating enough. Usually it’s both. In the late 90’s, we saw the rise (and subsequent fall) of the lean mass gainer, a low calorie drink that magically caused you to gain mass. In all cases, these products contained creatine which causes rapid water weight gain. It was a neat trick but served only to confuse lifters who apparently thought that they could build muscle out of hopeful thinking and thin air. On top of that, there is a pervading belief (perhaps we should call it a desire) to gain mass while losing fat at the same time. While fat beginners can pull this off, as can those returning from a layoff, anyone past the beginner stage will find this generally impossible without the use of repartitioning drugs or complicated diets which alternate distinct periods of over- and under-eating (such as the mass variant in my Ultimate Diet 2.0). The strategy I regularly advocate is the alternation periods of specific mass gain (accepting fat gains) with specific fat loss (minimizing muscle loss). This avoids the buildup of excessive bodyfat levels, while allowing one to gain mass. I discuss this more in the article General Mass Gain Philosophies. The bottom line is this: building muscle requires a surplus/excess of two things: the building blocks of muscle (protein/amino acids) and energy (calories). You can’t build muscle out of nothing and, without both in sufficient amounts, nothing happens. I’ll discuss protein intake in Part 2, here I only want to look at total caloric intake. Bodybuilders always want to know “How many calories for mass gains?” to which the simplest answer is “Enough.” In principle, for mass gains calories should be high enough that a small fat gain is seen (as measured by calipers) every couple of weeks. This should be more than sufficient to support muscle mass gains. As as starting point I usually suggest 10-20% over maintenance calories for mass gains. Of course, this assumes that you know what your maintenance calories actually are. If you do, just add 10-20% to that. If not, a caloric level of 16-18 calories per pound is usually a good starting place for mass gains; this then has to be adjusted based on real world results in strength, mass and body fat. I’ve also known individuals who had to consume 25 cal/lb to gain weight/mass. The big variable here usually has to do with non-exercise activity thermogenesis (NEAT) which I discuss in some detail in Metabolic Rate Overview. In short, NEAT refers to activities that aren’t exercise that burn calories. Fidgeting, moving around, etc. And people vary drastically in how NEAT responds to overfeeding with some people (the stereotypical ‘hardgainer’) often shown massively increased NEAT when they try to eat a lot. So calories that would go to support muscle growth just get burnt off with excess activity. But I’m getting off topic. In any case, I suggest trainees start at that calorie level and make adjustments depending on biweekly body composition measures. So start at say 18 cal/lb and see how your caliper measurements (men should probably use abdominal, women thigh as these tend to be most representative of body fat levels) change after 2 weeks. If they went up a little (maybe a couple of millimeters over 2 weeks) and you’re gaining strength in the gym, you’re probably at a sufficient calorie level to maximize growth without excessive fat gain. More calories probably won’t increase muscle gain but may give disproportionate fat gain. If neither weight nor body fat has increased, calories are too low. At that point, I’d suggest adding another couple of hundred calories per day to your diet. Eventually you’ll find that calorie level that starts putting weight on you. Obviously, as you get bigger, you’ll have to add more calories as well. Of course, if body fat has gone up significantly more than that, calories are too high and should be scaled backwards slightly. I’d note that, if you start at the low end of my calorie recommendations, too many calories shouldn’t generally be a problem. And as noted up above, my general experience with folks who can’t gain muscle mass is usually an issue of too few calories (or truly absurd training schemes) rather than too many. While it should be a no-brainer, water intake is another place where trainees make basic mistakes (I am guilty of this myself). The effects of dehydration range from minimal (at 2% dehydration, strength and performance decrease) to painful (can anybody say kidney stones) to worse (at 10% dehydration, death can occur). While there are many generalized water intake equations (such as 8 glasses per day), these may not be correct for everyone. To poach another guideline from my mentor, a good rule of thumb is 5 clear urinations per day, and 2 of those should come after your workout. Yes, that means looking in the toilet when you pee. This gives trainees a way of individualizing water intake. Obviously someone who lives in a hot, humid environment (or trains in a non-air conditioned gym) will need more water than someone who lives in moderate temperatures and trains in a posh gym. I’d note that, despite more dogmatic rhetoric to the contrary, all fluids contribute to hydration state (as do many high-water foods such as fruits and vegetables). Yes, even caffeinated ones; research clearly shows that the small amount of fluid lost from the caffeine is still much less than the amount gained by drinking the drink. It’s worth nothing that recent research has found that plain water is actually the worst drink for rehydration following exercise. Milk was actually shown to be superior to either plain water or Powerade/Gatorade type drinks, most likely due to the potassium and sodium content. You can read more about this in the artilce Milk as an Effective Post-Exercise Rehydration Drink. Finally, thirst is a poor indicator of hydration state. By the time you’re thirsty, you’re already a bit dehydrated. So between now and Monday, I want you to take a look at your overall nutrition (I know it’s only a few days, I originally wrote this article and it’s second part with a month between them), looking at your current meal frequency, total caloric intake and water intake. This means keeping a food log of everything you eat and drink during the day. You should keep such a log for a minimum of 3 days (including one weekend day, where most of us let dietary discipline lapse) up to a full-week. You’ll also need a basic calorie counter to determine caloric intake. Now check what you came up with against the guidelines above. Are you eating at a suffiicent frequency (~4-6 times per day with 3-5 hours between meals), are you getting sufficient calories to support mass gains, are you getting sufficient hydration (check your pee) daily. If the answer is ‘yes’, you’re ahead of the game. If the answer is ‘no’, you need to work on fixing those issues before you worry about anyting else. 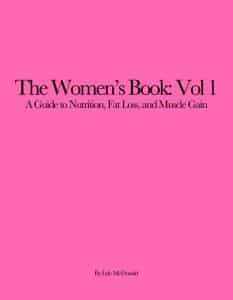 Read The Baseline Diet 2009: Part 2.